HERITAGE HIGHLIGHTS: The Grand Shaft boasts the only known example of a triple spiral staircase in England. At the height of the Napoleonic Wars, the threat of French invasion on the south coast of England was very real. The government put into place a comprehensive set of coastal defences to counter that threat. One of the most ambitious of these was the development of the Western Heights above Dover which together make up the largest set of Napoleonic defences in Britain. Here they planned a huge fortification; a system of redoubts surrounded by moats. So big was the project that it was nowhere close to completion by the time the Fench threat evaporated. The fortifications were not totally finished until the 1860s. Only the moat surrounding the fortifications can be regularly visited, though the redoubts are open on special occasions throughout the year. Among the areas of the defences are the Drop Redoubt, Detached Bastion, and Military Hospital. 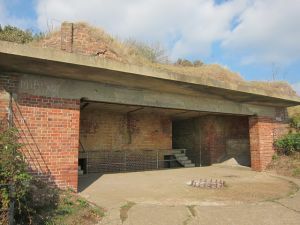 A later addition is St Martins Battery, a gun post completed in 1876 and later used in the Second World War as an Emergency Coastal Battery. At the core of the defences is The Citadel, designed to be the last bastion of defence should all the other defences fall. The area of the Citadel has been used recently as a youth detention centre and immigration centre. One of the most fascinating features of the Western Heights defences is The Grand Shaft, a vertical tunnel built between 1806-09 as a way for troops to quickly get from the Heights to the town below. The Grand Shaft is built of two concentric brick cylinders, 140 feet high, within which are three intertwined spiral stairs of Purbeck marble. It was the brainchild of Brigadier-General William Twiss, who was also responsible for engineering the Royal Military Canal, and the construction of the Martello Towers along the south and east coasts. At the base of the Shaft is a tunnel leading to Snargate Street. At the end of the tunnel is a guardroom, which contains prison cells. The reason for the cells is simple, and it has nothing to do with the threat of French invasion. It seems that in the early 19th century Snargate Street was a red-light district, with many taverns. The cells were used to allow drunken soldiers a place to sleep off a night of revelry. Quite apart from this risque history, the Grand Shaft is an extraordinary engineering achievement and the only known example of triple spiral stairs in the country. 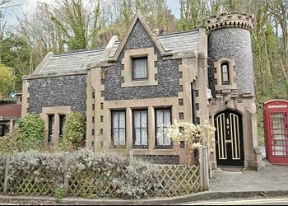 Though owned by English Heritage, Western Heights is part of the White Cliffs Countryside Project and is maintained by the Western Heights Preservation Society. A very short distance away is the Knights Templar Church, where King John submitted to the Papal legate in 1213. Location: On the west side of Dover overlloking the harbour. Can be reached via North Military Road or South Military Road. Sitting room with double sofa bed (for + 2). Dining room. Well equipped kitchen. Narrow stairs to first floor: Bedroom with canopy bed and turret. Bathroom/WC. Beamed throughout.